There I was, walking across the University of Alberta campus in 1992 – stupid, lonely, horrible — and at my feet on the concrete outside the Central Academic Building was a playing card, face down. I’m a believer is signs and wonders (and I was thinking seriously about dropping out of my statistics class) so there was no way I could walk any further without drawing the card – a wild card, free-range, occurring naturally in the earth. The back of it was printed with some tiny, uniform pattern, white and blue. And I wasn’t so bad at statistics that I could fail to know the odds were ten to thirteen – excellent odds — that the side of the card still pressed against the ground would bear a number, pips. There was a three out of thirteen chance it would be a face card with eyes and hands, a crown and a weapon, footless. There was only a one in thirteen chance it would be a queen. As I stooped to flip it over, I decided that if the card was a queen – just lying here, at this precise time — it would mean something. It was a queen – the queen of clubs. It’s the lowest suit, the flower queen, dark-robed, white-faced, grim. No one writes songs about her. And what is that clover thing of hers supposed to be good for anyways? I picked the card up, right in front of everyone else walking by, as if it was mine. No one asked. I took the card to the library, found some kind of book – I have no idea anymore what it was called or even what term I would have typed into the clunky database to find it. All I remember of what the book said about the meaning of the queen of clubs is one word: worry. That was my sign. Worry — it wasn’t good but it was true. I kept the queen of clubs, took it home, taped it to the wall beside my bed, right next to a colour print of a detail from a painting of the Virgin Mary that had fallen out of a different library book and landed on the desk, as if it was a sign too. This Mary was languid, brown-haired like she’s supposed to be. My hair is yellow. They always said it would turn brown but it never did. That’s why it was never me but my sister who they got to play Mary in the pageants at Christmas. They told me to be the angel – which was embarrassing because, in the book, the Christmas angel is clearly a boy, a white-haired boy. Little, neuter, dirty-blonde me, the fake Christmas angel standing on a kitchen chair. The signs stayed posted on my wall until I moved. The first time I unpacked, I hung them up again. When I moved for love, they stayed in a box. They’re still here somewhere – I think. I could probably find them again if I wanted to but – signs change. 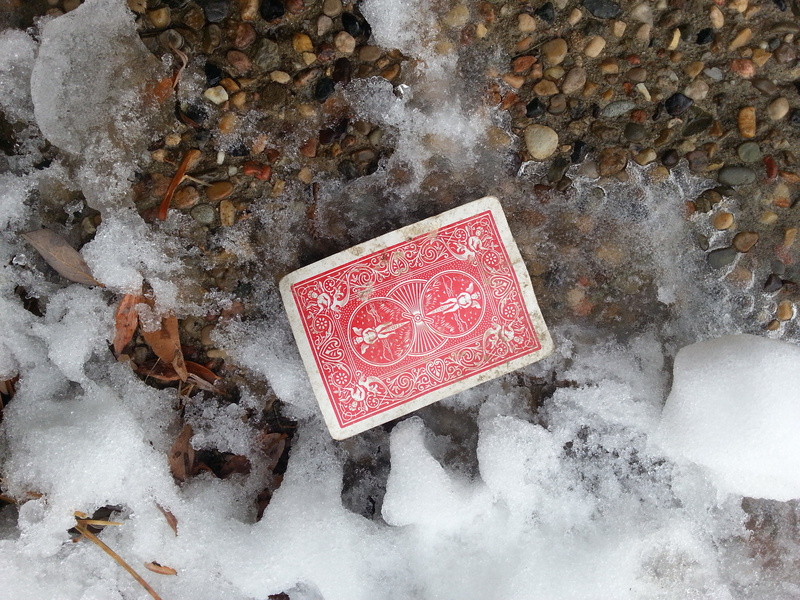 And today, as I walked over the wet ice and traction sand on the road in front of the mailbox, I stepped over a single playing card, face down in the freezing, dirty water. Its back was printed in a pattern called “bicycle,” white and red. I’m more of a believer in signs and wonders than ever and I did end up with an improbable A in that statistics class so there was no way I could walk any further without drawing one more wild card. Signs may change but odds don’t. The odds were still just one in thirteen that the card would be a queen. If it was a queen, I would have no idea whether it meant anything. I stooped in the middle of the road and picked it up. I’m not stupid, okay. I know that if this was fiction, I’d have to write this story so that the card was not a queen. It would have to be something else or we’d all hate this story. It would be silly. We’d be right to sneer at it. But this is a real story – the kind that doesn’t need my permission to be a little bit perfect. Here I was, on a Tuesday in November, two hours before my kids got home from school, with a new sign, a real sign — the queen of hearts.